Kudremukh means “horse face”. Kudremukh is situated in Karnataka in the Chikmaglur district and is surrounded by hilly area of Kudremukh. There are natural and dense forests and captivating hills. Kudremukh is a part of the Western Ghats and is also known amongst twenty five biodiversity hot spots of the world known for the conservation of biodiversity. It is also known for ore mining and the companies associated with the mining of ores carry out their operation and other processes involved for transportation of slurry to Mangalore via pipelines. Kudremukh is also known for its natural and scenic beauty, rich wildlife and dense forests. A drive within these forests is often thrilling. Such factors of environment often attract tourists to this place. 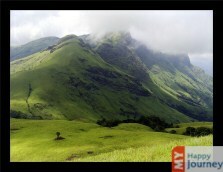 The Kudremukh national park is spread over 600 sq. kms, and has lush green forests. It receives 7000mm of rainfall annually. The water retaining capacity of the land has led to the creation of perennial streams of Tunga, Bhadra and Netravathy Rivers. This place houses a wide variety of flora and fauna and it acts as home to Gaurs, Chitals, Leopards, Mongoose, Wild Boars, Malabhar Giant squirrel, Sambhar, Tigers and many other species as well. Other major attractions here include Lakhya dam, a Radha Krishna temple and the Hanuman Gundi waterfalls is actually worth a visit. The place is also perfect for indulging in activities like trekking, but only after getting permission from forest department. The lobo’s place is famous for trekking and while trekking allows you to witness the beauty of this place, called Kudremukh.